Title Advanced investments. Season 1 [Hoopla electronic resource]. Publication Info. [United States] : The Great Courses, 2014. Description 1 online resource (24 video files (approximately 720 min.)) : sd., col.
Great courses (DVD). Business & economics. Contents Episode 1 Investment Decisions and Goals Episode 2 A Framework for Investing Episode 3 Mistakes Investors Make Episode 4 The Characteristics of Security Returns Episode 5 The Theory of Efficient Markets Episode 6 Evidence on Efficient Markets Episode 7 Valuation Formulas Episode 8 Bond Pricing Episode 9 The Term Structure of Interest Rates Episode 10 The Risks in Bonds Episode 11 Quantifying Interest Rate Risk Episode 12 Value Creation and Stock Prices Episode 13 Present Value of Growth Opportunities Episode 14 Modeling Investor Behavior Episode 15 Managing Risk in Portfolios Episode 16 The Behavior of Stock Prices Episode 17 The Capital Asset Pricing Model (CAPM) Episode 18 How to Exploit Mispriced Securities Episode 19 Performance Evaluation Episode 20 Market Making and Liquidity Episode 21 Understanding Derivatives Episode 22 Using Derivatives Episode 23 Pricing Derivatives Episode 24 Trade Opportunities or Risk?. Performer Steve L. Slezak, Professor, University of Cincinnati. Summary Investing can be a valuable part of achieving your hopes and dreams. 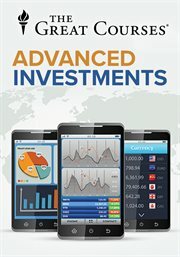 Now, in these 24 lectures by Professor Steve L. Slezak, learn practical techniques for analyzing if a potential investment is a good deal, for measuring risk, for determining the relative advantages of active and passive investments, and much more. Added Author Slezak, Steve L.
- Can't find what you want?